I've decided to start a series of 40s and 50s hair how-tos and this is my first one! These vintage type styles are definitely my favourite to do and also my favourite to wear. There are many, many different ways of doing Victory Rolls but as my first vintage hair tutorial I thought i'd do the simplest version! 1. Firstly, part your hair to the side. The side which has the most hair on will be the bigger roll. 2. Lift that section of hair up and comb from the outside. Grabbing the hair, tease from the root to the middle. (never back-comb the ends as that's what causes the damage). 3. Taking the recently teased section, while holding the middle of the hair, flip it round into an upsidedown U shape, this is where you'll begin your victory roll! 4. This bit can be a little tricky, so don't feel disheartened if you're trying to do it for ages and your arms feel like they're going to fall off. (that's what happened to me more than once..!) Holding the hair make a circle. While making the circle work the hair inside the roll. Think of it like you're winding a bit of rope from the outside in. 5. Position it to where you want it. Here you can choose whether you want it small, big, neat, loose. It's entirely up to you! 6. Holding it with your finger in the spot you want it, grab a few bobby-pins and begin neatening it up and securing it in place. 7. Add a few more pins until you're satisfied and give it a little hair spray action. 8,9,10,11,12. Do exactly the same as you did on the first section and then you're done! Woohoo! The rest is up to you, you can wave the left over hair, you can pin it all up, add some flowers, do a chignon. There's so many possibilities haha. I hope you like the sound of the 40s and 50s hair tutorial series. I'm always looking for ideas so please let me know if you want me to do a certain hair style! Also if you try it, show me a picture of it, that would be ace! P.s You can do this hair-do with mostly any length hair. OMG you look amazing pin-up girl eat your heart out! Absolutely, this quite tough to do though it seems easy, but its a adorable hairstyle have antique look, I think you anyone can do this hairstyles , specially don't need hair extensions or great hair volume. It loo pretty and suits all face shape also suitable for all age. What do you think? Why do you always just look so beautiful? Grace maaaan. You're such a beauty! xo P.S this sounds incredible! I love your tutorials, you make things look so simple. ughhh grace, you're such a hottie! I'm still growing out a full fringe so I don't know if it will work but I'm definately going to give it a go! i absolutely LOVE this, and i think your tutorial has been the easiest one i've found. i love that you put .GIFs with hair tutorials. i saw the one you made for that puffy bun updo a while back on your tumblr...really made me want to do it even more! Can you move to Paris and become my hairdresser please ? I will feed you candy. Your blog is amazing, I'm so addicted to hair and I think you're doing it great!! i'm book marking this page, gonna have to attempt it at some point! Errr hello beautiful lady! Your hair looks so pretty, I am in awe. this is gorgeous! i'm going to try this tomorrow, i don't think i can concentrate enough to give is a go right now beccause i'm super sleepy. it really suits you! i don'y know how on this earth you managed to teach yourself that! its insane! i wish my hair was longer so i cold try this..
You're gorgeous! 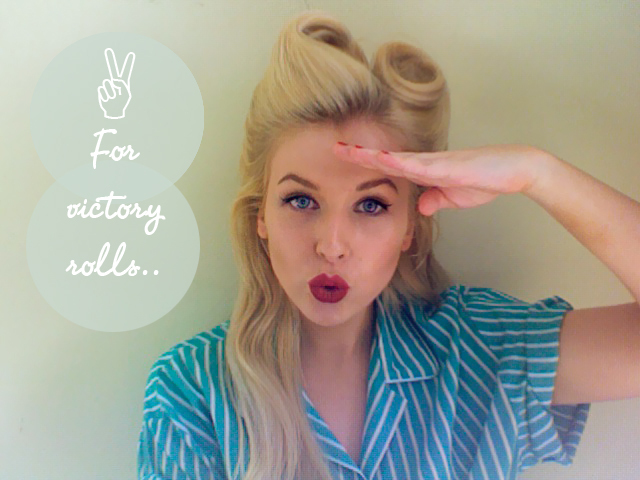 You make victory rolls look so easy, gotta give it a go now, got no excuse! Sorry to comment twice, what gif maker do you use to make these? follow you now... like your blog! I just found your blog and LOVE it! Very neat tutorial! You have the most amazing hair ever! Am going to keep this bookmarked for when my fringe grows out!! gorgeous hair tutorial. love it. I'm so glad you did this tutorial Grace! I've been looking for a good one so i can try it myself. I love the step by step. Really helpful! Well done!! I love the style and the way you presented it! !